What’s Not in My Disney World Hotel Room? A while back, I wrote about all the useful things you’ll find in your Walt Disney World hotel room. After a recent spate of non-Disney and semi-Disney travel (sacrilege, I know), I’ve realized that there are also a number of things that many travelers might expect to see in their Disney hotel rooms, but won’t be found there. Please be aware that some of the items on this list can be found at a select few WDW hotels, but not all of them. Be sure to consult with your own resort directly if you have concerns. You’ll find a refrigerator in your Disney hotel room, but there’s no mini bar. My mother pointed this out to me after she joined me for a stay at Disney’s Bay Lake Tower earlier this year. Her aging eyes had trouble doing her makeup without the magnifying mirror she was accustomed to finding in hotels. Since she mentioned this, I’ve stayed in about a dozen non-Disney hotels and sure enough mom was right, all but one of the non-Disney hotels was equipped with a magnifying mirror in the bathroom, while the vast majority of Disney hotels do not. If your eyes are on the downswing or you routinely use a magnifying mirror for personal maintenance, they you’ll want to bring your own from home. I spent part of this past summer on the Adventures by Disney excursion to China. This was an incredible experience. A small part of that was due to insanely over-the-top awesome hotels we visited (Ah, Peninsula Shanghai, I miss you so!). One of the countless details which made the hotels seamlessly efficient and luxurious was that in addition to the usual soaps and shampoos, the bathrooms were all stocked with teeny tubes of Colgate. So great, right?! While toothpaste is certainly available for purchase in the WDW gift shops, you’ll no doubt note here that toothpaste is almost never found in US hotel rooms. (You can read more about this in a Slate article that hotel geek me found fascinating.) So, if you’re an international guest expecting toothpaste to be a standard feature, you’re out of luck. Some US hotels do offer complimentary in-room toiletries beyond the basic soap/shampoo/conditioner/lotion that Disney provides. 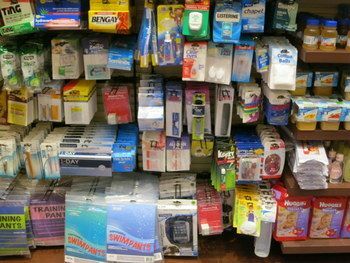 Again, while all of these items are available for purchase in your gift shop, you won’t find razors, shave cream, nail files, Q-tips, cotton balls, sewing kits or other nice niceties provided in your room. 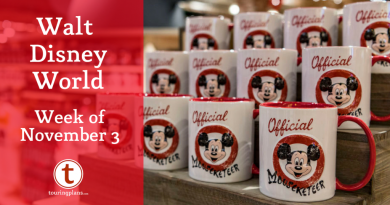 Guest staying at Disney’s moderate and deluxe hotels will find a coffee maker in their rooms, but if you’re staying in a standard value room at Pop Century, All-Star Movies, All-Star Music, All Star Sports, or Art of Animation, then you’ll have to head to the food court to get your caffeine fix. Some guests in this situation opt to bring their own coffee maker. A quick spin on Amazon, and you’ll find several drip machines retailing for less than $15.00. Even if you decide to leave it at the hotel, this small investment could end up saving you a fortune at Starbucks. You can buy nearly any toiletry in the hotel gift shop, but you’ll only find the basics as in-room freebies. Only guests at the swanky Grand Floridian will find a robe in their hotel closet. Everyone else will have to bring one or improvise. My personal strategy is to bring a lightweight terry gown that doubles as a swim cover-up at the pool and as a post-shower wrap in the room. Yes, I’m exaggerating, but not much. There will be a few open electrical outlets in your Disney hotel room, but nowhere near enough of them. When I travel with my three teenage kids and their multitudes of electronic gear, a power strip or two is essential equipment for the room. Several of the Disney hotels offer very little counter space in their bathrooms. (I’m talking to you, Contemporary Resort!) It’s not a big deal if you’re traveling with just one or two adults, but if you’re traveling with a larger family, you may want to consider bringing a toiletry bag that hangs on a door. Again, I exaggerate. There are, of course, lamps in the Disney World hotel rooms. 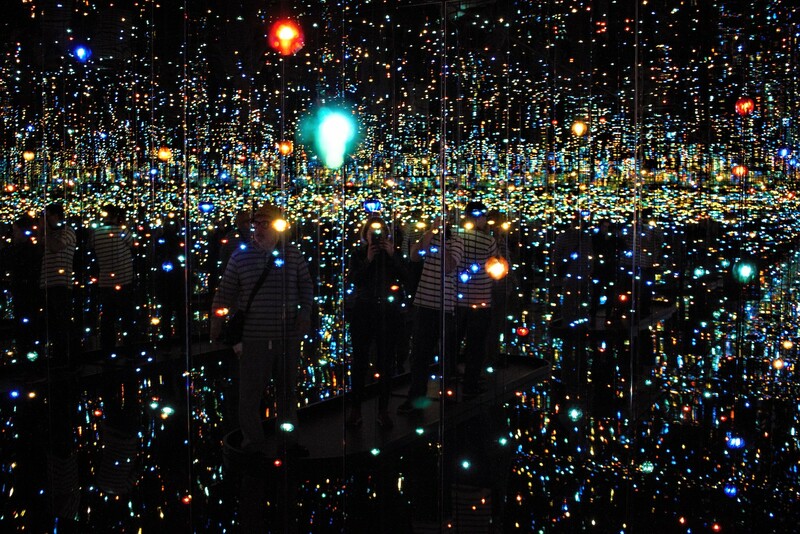 However, many guests find them provide inadequate lighting. I’ve found it so bad on some occasions that I’ve plugged in my phone and set it on a bright flashlight mode just to up the wattage in the room. If you’re particularly sensitive to low-light situations, you may want to consider bringing a battery powered lantern. Many of your favorite television stations are not available in your WDW hotel room. The Disney World hotels do include a small refrigerator, but these are kept empty for you to fill. On the plus side, there’s no $15 tin of macadamia nuts to distract you from your diet. But on the minus side, if you’re in the mood for late night munchies, you’re stuck with room service or the vending machines down the hall. BONUS TIP #1: In many of the WDW hotels, the vending machines alternate by type on each floor. For example, there are beverage machines on floors 1 and 3, and snack machines on floors 2 and 4. If you want both a Coke and some chips, you’ll need to make use of the stairs or elevator. BONUS TIP #2: One of the hotels included in the Adventures by Disney trip to Germany includes a mini-bar stocked with FREE beer. Prost! Many moderate to deluxe hotels in the non-Disney world provide guests with in-room bottled water either free or for a feee depending on their policies. You won’t find bottled water provided in the vast majority of Disney rooms. Given the perceived unpleasant taste of Florida tap water, you may want make a stop to stock up on water bottles at a local supermarket or bring a filter with you. There’s not much counter space in some of the WDW hotel bathrooms. A hanging cosmetics bag can help. Some European guests may expect to find this as a standard feature. It’s not a common component of US bathrooms. While the Disney TV situation has improved somewhat since I wrote this post, they’re still lacking several channels that are considered standard by many travelers. Notably absent from the Disney TVs are Comedy Central, HBO, and Showtime. If you need your Colbert or Homeland fix, invest in a Slingbox. While you can still ask for a key card, Disney appears to be phasing out the credit-card style room keys they’ve been using for eons. Use your MagicBand to open your room. The future is here. Is there anything that you typically find in other hotels, but is missing at the Disney resorts? Is there anything you wish they stocked to make your stays easier, more relaxing, or just plain better? Let us know in the comments below. Yacht Club – magnifying mirror, extended toiletries( even includes sunburn gel), robes, coffee maker. Try staying at the Yacht Club …. Just saying…. Well, you do get what you pay for. We loved Yacht Club. Stayed there last month on the concierge floor (30th wedding anniversary). We just had an excellent visit at the Contemporary, and you’re spot on about the lack of bathroom counter space (we just turned one sink into a toiletry staging area). But FYI we did have robes and toothpaste in our room (but maybe that’s also because we were on the concierge level floor – which was amazing!). The Grand Californian had bathrobes, two, one for me and my husband but not a third for my daughter (she’s 7). You could imagine the disappointment, she ended up wearing one of ours, it was pretty funny (she’s shorter than some 5 year olds). Both the Grand Californian in Disneyland and the Animal Kingdom Lodge (our home away from home) have tons of counter space in the bathroom. One thing that the Animal Kingdom Lodge had that Grand Californian did not was a stool (upon request) for my daughter to reach the sink to wash her hands. Grand Californian said they used to have them but it was too much of a safety liability. I’m really surprised that AOA doesn’t have coffeemakers since they have a ‘kitchenette’ in them. There are coffee makers in the family suites at AoA (which is most of the resort), but there are no coffee makers in the Little Mermaid section which has standard value rooms like those at the Pop and All Stars. Sorry for the confusion. While most US hotels dont provide toothpaste, toothbrushes, razors, etc. You can often go to the front desk or concierge desk and they will give you free ones. I’ve done this at the Swan. I’m not sure if the real Disney hotels support this. Yes, they do. Last summer, my son and I arrived a Disney (Animal Kingdom Lodge) several days prior to my husband. He left his toothbrush at home. The front desk delivered a travel packet with toothpaste, toothbrush, and (I believe) dental floss. He didn’t ask for shaving supplies…I had packed those:). I’ve actually had mixed luck with this. They will often bring you forgotten toiletries during the middle of the night, but I’ve been told during the day to stop by the gift shop. And while I don’t have real evidence of this, my guess is that you might experience different reactions to you request at a value vs a deluxe resort. For what it’s worth, I had good luck getting a few bandages for free for my son (who skinned his knee) mid-day at the BoardWalk front desk. I wasn’t staying there, but I figured the worst thing he’d do would be to tell me to go to the store and buy some. They guy I asked had an earpiece and a suit, so he probably was a manager. Perhaps he was more prone to help me (he had to go find some) than a front line person with no power. With regards to bandages for skinned knees, I tripped while running a couple of years ago in San Francisco, and skinned my knee up pretty bad. When I got back to hotel and asked them where I could get a band-aid, they were all on it – calling someone over with a first aid kit and stuff. I may be cynical, but I bet it has to do with minimizing lawsuits and/or company liability. We just returned from a vacation at the Animal Kingdom Lodge. It was our first time staying on site and we loved it. Plenty of counter space but I did mention we would bring a power strip next time. I think that based on the fact that most luggage is brought up to a few hours after guests arrive it would be great if the hotel had items like toothpaste and toothbrushes waiting for you. After a long flight and bus travel it would be great to brush your teeth before going out to adventure. It has been a few years since I have been to WDW, but I will agree with the water. I thought I would died. It was so bad. 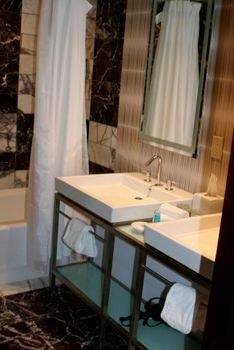 However, I was just at the Disneyland Hotel in CA, which has been remodel and they only had one sink in the bathrooms and they were very small. Which in WDW Riverside we had two. And much more roomy. We stayed at Port Orleans – Riverside and we didn’t have any kind of dresser or chest to put clothes in. Now, we did request a room with a Murphy Bed (& this was our first stay at Disney), so I’m not sure if it was a trade off, but with 4 people for a week,it felt like we were tripping over suitcases the whole time. I would have happily traded the little table in the room for a few drawers. On the subject of mini bars in the room. A lot of hotels in North America have gotten rid of them do to lack of use or poel using them and claiming they didn’t use it. Comfortable chairs! If you wish to sit in your room, you are usually limited to the two wooden chairs that come with the round table or to your bed. Lack of a “comfy” chair comes in to play for many seasoned citizens such as myself, who have difficulty sleeping in a bed due to arthritis or other physical problems. On my last visit to Disneyworld, I rented a recliner from K&M Rentals. Delivery and pick up went with no problems and the Lazy Boy recliner was comfortable for me to get a good nights sleep. I realize that space in the room might limit the addition of such a chair and I encourage others with similar physical limitations as myself to take advantage of the local rental companies. You will find this shocking, as I truly did. When my shaving supplies ( and expensive shampoo) were thrown away during a stay I had to go repurchase them. I was staying CLUB level at the yacht club and I inquired at our desk for replacements they were NOT offered. I gave them opportunities to provide some and asked if I needed to go downstairs and buy some and yes I did. Much disappointment was had by me. When I stay that level I expect more. Even the Holiday Inn gives you a razor if you need one. I did follow up and complain. A note on in-room mini-fridge: We found thermoelectric coolers in Caribbean Beach and Saratoga Springs resorts a few years ago. Since it was summer and hot they couldn’t keep up so quite a few food items went bad. We had to call maintenance to have them swapped out for real refrigerators. There are not refrigerators in all the resort rooms right now. There “should be,” but in early December my room at All-Star Music didn’t have one. See this old blog post for the story about the massive in-room refrigerator replacement process that’s underway. Also, I’ve found that not all the refrigerators have freezer compartments like the one shown in the photo in this blog. But if you need something frozen, Bell Services should be able to store something in its freezer for you. I was wondering if they had replaced the refrigerators yet. I thought they hadn’t yet. We will be staying at All-Star Movies in Jan. Does anyone know if the refrigerators will be replaced there yet. Nice article, but I miss virtually none of this. The only toiletries I want or expect at any hotel are soap and shampoo. Why would I want to use toothpaste the hotel has chosen rather than my own choice? And I am SO glad there is no minibar! I do agree on the reading lamps. DVC resorts have a room safe that easily takes a 15″ laptop and probably 17″ as well, but otherwise you are out of luck. I doubt that key cards will be disappearing, unless they find a way to force everyone to register for a MagicBand in advance. My teenage daughters are fanatical about shampoo brands and will always bring their own if we have the room, but they couldn’t care less about what kind of toothpaste they use. I’m always looking for ways to make more space in that little ziplock so we don’t have to check luggage. The worst for me is not having access to Disney Junior on the TV. There really are no little kid channels at all for the 1/2 hour before bed or when the baby goes down and my preschooler wants to relax for a couple of minutes. I pack DVD’s because we stay at DVC resorts and they do have DVD players. 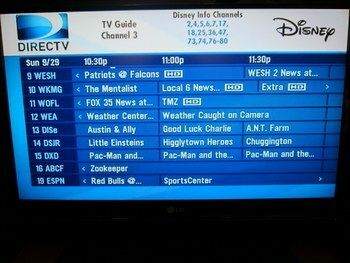 Wait, WDW does not have Disney Jr on its tv systems? That seems insane to me. I never use the coffee makers in rooms. No idea who before for you did what to them. And I assume that they are ever properly cleaned by housekeeping. We can add – a list of TV channel numbers. Having the list on one of the channels doesn’t help if you don’t know the number, and it takes forever to scroll through the list anyways. At the All-Star Movies, is there a refrigerator? I’ve been told yes and no, so I’m a bit confused, haha. Refrigerators became standard equipment in all value resort rooms (including the All Stars) in 2012. However, there was a recall of the refrigerators in mid-2013 and they were all removed and are now in the process of being replaced. I’ve been told that many of All Star rooms do now have their refrigerators back, but there may be some rooms that have not been re-equipped. 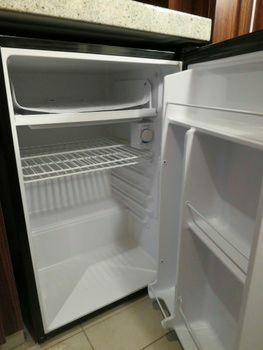 If you are placed in a room without a refrigerator and would like to have one, simply call the front desk of the hotel and they will have one delivered to your room. There should be no additional charge for this.